Veneziano was an early Renaissance painter who worked in Perugia, Tuscany and Florence. His masterpiece work, called The Saint Lucia dei Magnoli Altarpiece, or Saint Lucy Altarpiece, now hangs in the Uffizi Gallery. 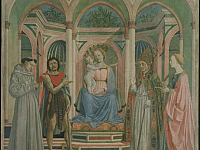 It was originally painted for the Church of Santa Lucia dei Magnoli in Florence, of which the center panel, Virgin and Child with four saints is what survives at the Uffizi. 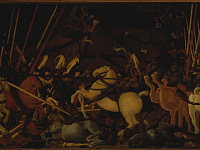 Other pieces from the predella panels of the work, including Saint John in the Desert, have toured other institutions such as the National Gallery of Art in Washington D.C., also in Cambridge and Berlin. While much about Veneziano’s life is unknown or even contested, he is considered a founding painter of the 15th century Florentine School. His birth name is Domenico di Bartolomeo da Venezia, and the surname Veneziano may indicate his birthplace of Venice. As a young boy, he is said to have trained with Gentile da Fabriano (1370 – 1427) in Florence, but might have also had exposure and training in Venice in the International Gothic style of northern European artists. It may also be the case where he trained and worked with Pisanello (1395 – 1455) in Rome. There are two early works of Veneziano that are of his few surviving piece, though badly damaged. One is a fresco, Virgin and Child enthroned, the other is a work of two heads of saints which were from the Carnesecchi Tabernacle in Florence. Within these pieces is a noted influence of one of Italy’s first renowned Renaissance painters, Masaccio (1401 – 1427). There is also an influence from the Florentine painter, Benozzo Gozzoli (1421 – 1497) in Veneziano’s works. There is record of Veneziano having worked on frescos with Piero della Francesca (1416 – 1492) for the church of Sant’Egidio in the Hospital of Santa Maria Nuova. These frescos, now lost, depicted stories from the life of the Virgin, but were left incomplete and later finished by Alesso Baldovinetti (1425 – 1499), who Veneziano notably influenced. Veneziano worked with Francesca later again on frescos in the Church of Santa Maria in Loreto, but these were also left incomplete, due to a plague outbreak. Veneziano’s last work was in the Church of Santa Croce, a piece of Saint John the Baptist and Saint Francis. The artist was well know and regarded for his effective blending of colour and use of perspective for the period. Another noted influence on an artist he had was towards innovative painter Andrea Mantegna (1431 – 1506). Some of Veneziano’s legacy is fallacy as well, at least in the account of the influential biographer and artist Giorgio Vasari (1511 – 1574). It was alleged that Veneziano was the first painter to use oil in Tuscany, and shared his then secret technique with another young artist Andrea del Castagno (1421 – 1457). Vasari then claimed that Castagno, in order to retain the secret technique for himself, murdered Veneziano. Though there is no historical evidence that Veneziano was the first oil painter and as the dates show, Castagno died four years before Veneziano.